Dog training is perhaps one of the richest and useful topics you can explore. From your puppy's earliest years and throughout the rest of his/her life, the learning and training never stops. Potty training: Whether you prefer your dog goes outside, inside or even uses a doggie litter box, get provide tips to help you build on your successes. Crate training: A sensitive issue for some pet owners, proper crate training is also covered. Learn how a properly used crate can be an appreciated safe haven for your dog. Need to train your dog to stop destructive chewing before all your worldly possessions wind up in the trash? Great advice just waiting. Ever wish your dog would just listen to what you're saying? obedience training can help that wish come true. Get a basic tutorial in obedience that will point you in the right direction for finding training classes in your own locale. How about a sport you and your dog can truly share? 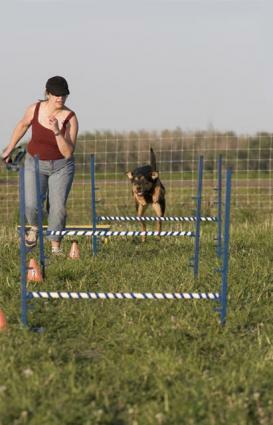 agility trials are the most rapidly growing area of the entire dog fancy in recent years. Learn the basics of agility training, the equipment, and the methods to get started. You'll also find all the training accessories you could ever need, including dog training books, videos/DVDs and equipment. Beginning to sound like fun? Training your dog should be a fun and rewarding experience that builds a stronger bond of trust between the two of you. Truly, a well trained dog is a friend for life, so check back often to see what's new.